The recent heat has left my poor garden suffering a bit. While I have always subscribed to the theory that if a plant needs too much care then it is not the plant for me, I feel sad when circumstances such as weather conspire against my kitchen garden. I haven't planted anything new for awhile as the heat would shrivel anything I dared to put in. We haven't had rain in awhile so all my once prolific tomato and eggplants are stunted and fruitless. Having said that, I got out there one weekend and cut everything back and harvested what there was to be picked. 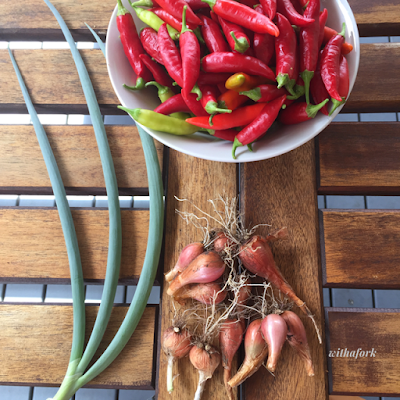 I ended up with a bowl of hot chillies, a handful of shallots and some spring onions. They were all used and enjoyed, so I do feel a little joy in eating the fruits of my meagre harvest. 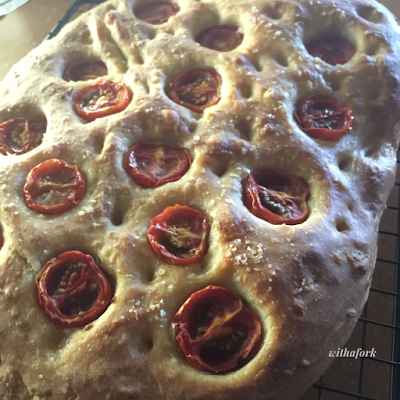 Some of the cherry tomatoes that did end up surviving the heat were used in one of my focaccia loaves. Even these aren't immune from the heat and I severely overestimated my proofing times. I ended up with a very puffy loaf, which although it looked a bit odd, was still tasty and enjoyed. After coming back from holidays over the Christmas break, I got back into the swing of baking with Lorenzo again. He's such a resilient starter, and I missed him while we were away. Shop bought bread just doesn't do it for me anymore, when I know that I can bake my own and make it just the way I like them. I think Lorenzo was happy to see me too. He put on a lovely performance for this bake. These loaves used up the very last of my beloved Trader Joe's Everything But The Bagel seasoning that a kind colleague from America brought over for me. I'm very sad about that as I haven't found another source and while I know Amazon have it, I cannot convince them to send it to Australia for me. There just isn't a comparible alternative seasoning I've found. Although I usually shop at Coles, I find that Woolworths have really upped their game in vegan offerings of late. Over Christmas, they advertised a vegan loaf, and my philosophy is that if I don't support vegan offerings, they'll think people don't want it. So I ventured to buy one. It took me ages to find it, and I had to ask three assistants for help. Eventually we tracked it down. In the meat section. I see where they are going with that. The helpful assistant who found it also proudly pointed out the vegan patties and sausages too, located right next to the meat equivalents. The only way to tell them apart was the packaging was a slightly different green, and reading the label proclaimed they were plant based. I did try to find a link to the loaf, but it's disappeared from the site, so perhaps it was a seasonal special or others also found it hard to locate. Anyway, I saw them marked down after Christmas and bought another one to keep in the freezer. Here's what it looks like - the red thing on the bottom right of the plate. I think it was lentils, beets and a few other things. To be honest, it wasn't that great, and I probably wouldn't have continued to buy them, but I applaud Woolworths for trying (they constantly have new vegan and gluten free options advertised). 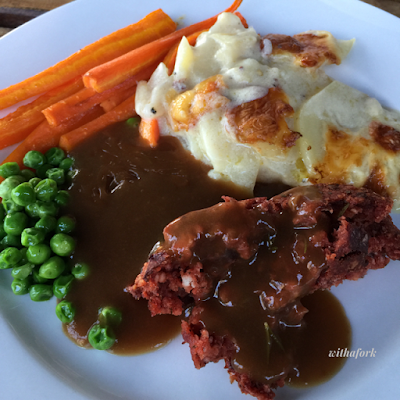 I served that loaf with maple carrots, peas (at the small man's request), some creamy potato bake (I use almond milk and haven't had any complaints). Also, gravy, loads of gravy because... gravy is delicious, but also, that loaf was dry. 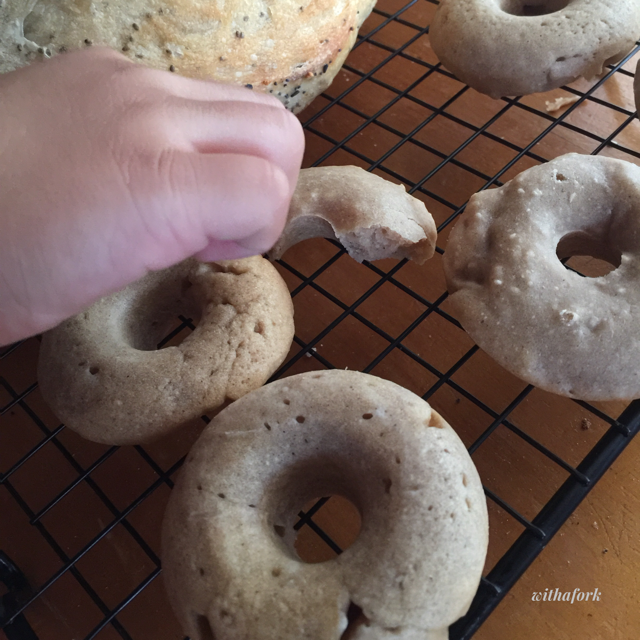 Finally, I have been experimenting with some baked vegan donuts lately because I bought a donut pan and I'm not having it in the house if I don't use it! I'm not sure I like them. I find them a bit dense and more like donut shaped cakes than anything else. I think it's obvious here though from the small hand sneaking in to grab one because he just could not wait for me to take my picture, that the kids do like them. So I've been making batches when the oven is on (like for baking sourdough, also visible in the picture! ), trying out various ingredients in the hope that I'll hit upon a fabulous mix, and freezing the experiments for school lunches. Miss E is in year one this year, and has quite liked taking a donut to school. By the time lunch rolls around it's defrosted sufficiently to be tasty I'm told. So at least the freezer is filling with school lunch possibilities. I am linking this into the monthly In My Kitchen round-up, hosted by Sherry of Sherry's Pickings. What's happening in your kitchen this month? Do you have any school lunch tips to share? Does anyone know where I can source more bagel seasoning? How sad that your garden is suffering so much in the rain. I would have sent some of our thunderstorm to you from a few nights back if I could - it was so lovely to hear the rain beating down as we don't hear that sort of rain often these days. I am also a little sad I can only see your last photo - hope it is just me with the broken photos. Glad lorenzo is perking up your baking - I have been pretty slack with sourdough baking lately with just making pizza rather than bothering with bread and am missing our home made bread - now that school is back I really need to step up for school lunches. Oh dear, thanks for the photo heads up. I think blogger has been eating quite a few images lately - it looks fine at my end and the only way I can find it is to use incognito windows if someone lets me know. I think I've fixed it now. Yeah… kitchen gardens aren't really 'a thing' in Qld are they? Nice in theory but the heat is just too punishing. Even my hardy bay tree has leaves drying on the tree at present. I commented recently on FB about Woolies offering a wide range of vegan products but suggested the best place was not in the middle of the meat section. Even if they were at the end of the chiller, that would be far better than vegans and vegetarians needing to face the fresh meat. Let's hope there's an end to this heat soon! Hope the recent rain hit you as well last night! I appreciated the break in the humidity for sure. Its funny that its so hot here, while up north is getting more rain than anyone needs (not funny haha, of course). That's a great idea about product placement at the end of the chiller. I just find it so odd that they want to integrate it so. I'd never think to look there! Back again to see your photos -- the first time they weren't showing up. Good to see that someone else is baking sourdough as my husband has been doing. Our starters are named Willard and Oz. 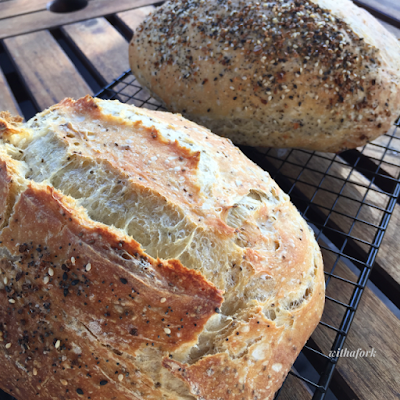 I love that you named your starter Lorenzo and I can see why - marvellous loaves! I have still to name mine. Ah I need to dig out my doughnut moulds and make some. That focaccia looks impressive. I've had mixed success with mine as I'm trying to make the Barese version with potato, and its a balancing act putting in the right amount of potato for it to rise. So much baking - I really want to get back into baking when baby number 4 arrives. We are on the final count down - 7 weeks to go.